The CHEMARK Enterprise Transformation Practice is an individualized process tailored to each client’s current situation and strategic business goals. 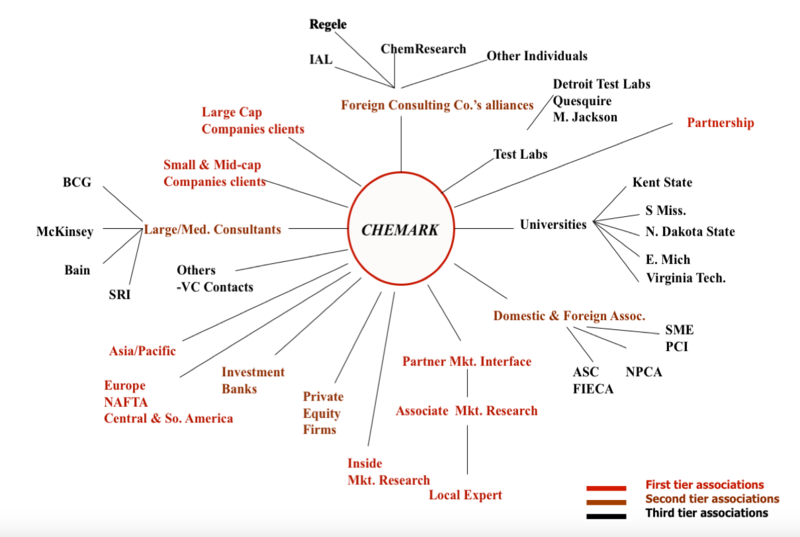 This process takes advantage of CHEMARK’ broad reach across various elements of the Ecosystem and reflects our experience along with the wide range of industry relationships we have established over 40+ years. Our Practice includes fine-tuning successful enterprises and extends to addressing the much broader, far-reaching transformation needs of multi-national corporations. Our methodologies are uniquely designed to achieve results in a shorter time-frame. They include Corporate Governance; Strategic Planning; Operational Planning; Organizational Alignment; Human Resource Alignment and Leadership Development Programs. Executive Assessment begins with getting a clear understanding of how each client views their current situation. Of equal importance is identify the vision their senior management has for the business going forward. Starting the process with a thorough diagnosis of the present business, ensures attacking the right problems in the right order. Once these initial inputs have been captured, CHEMARK individually engages senior management in private conversation asking for their responses to open-ended, customized questions. Improve results by adapting the governance model of the most successful companies to your unique business / culture. We will guide you through implementing five, interwoven activities that will keep you on top of all critical items throughout your business. Once in place, you and your staff will have better control of your future and more time for working ON your business. Ensure the business survives the loss of a key individual. Ensure business continuation by crafting an individualized transition plan for the CEO or other senior executive. Focuses on meeting the requirements of the business and the individual involved. Develop actionable plans that your company can implement instead of a book of (good) ideas that rests on the shelf, gathering dust. Implement major initiatives with higher quality and financial results. With our guidance for moving forward; step by step. Identification of the most critical areas for improvement with a plan for implementation. Over 90% of change management efforts FAIL. OUR SUCCESS RATE IS 100% using this methodology. Combine best practice models, insightful analysis, superior meeting facilitation, your knowledge of your business / industry, and our broad experience to get started improving your business results in less than 6 weeks. Value Chain or Supply Chain Alignment. Raise the quality of your human assets and watch your business prosper. Identification and development of high-potentials. NOTE: Assessments should not be used as the sole criteria for any action. Management judgment, interviews and other traditional processes should be employed as well. Accelerate careers and grow leadership potential. Raise the leadership skills of your entire management team (supervisor through executives) in just 12 months. Exposure (and then facility) with multiple leadership and business models. Personal Discovery (from the Mentoring Program). Foundation Setting (from the Mentoring Program). Plus, customized, individual improvement plans. Get the support you need, when you need it, in the way most useful to you. Programs fully customized for your situation.